So, how much would you pay someone to sift through your email each morning, deleting the garbage and presenting you with the 5 (out of 500) emails you need to respond to? If you already have someone like that, lucky you! But if you don’t, I bet this sounds like a dream. In the age of a constant flood of information, consumers will pay good money for a filter. So if you want to sell books, be the go-to person for your market. If you’re wondering how to become a filter, give some thought to the filters you may not even be aware of. For example, in the book publishing market I can think of two major ones: Dan Poynter and John Kremer. They are both filters. Why? Well, they have zeroed in on their focused market and have become the go-to people for everything publishing and marketing. 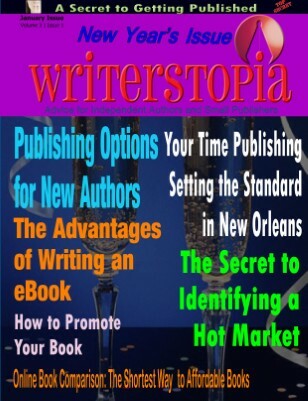 Writerstopia has done the same thing; they’re all about self-publishing and marketing for independent authors. While you’ll find filters in different markets, they share a lot of the same characteristics. Filters are out there weeding through information so you don’t have to, and then they are posting their findings on their website, blog, or talking about it in their podcast. Sometimes they’re doing a combination of all of these things to keep their readers informed. Next, filters are so laser focused in their market that not only can they filter out the “noise” for you so you don’t have to, they can then compartmentalized the noise into sub-filters. These sub-filters become even more significant, and here’s why. Increasingly, we are living in an age of customization. I mean when was the last time you bought an entire CD or read an entire newspaper? More than likely you’re buying your music one song at a time on iTunes, or you’re reading your news selectively or, in many cases, through RSS feeds that allow you to tap into only the content that you want. We’ll put all of this together in a moment, but for now, start thinking about the customized element to what you’re doing. Becoming a filter requires dedication, but the benefits will pay off in ways you can’t imagine (and many that will fill your bank account). When I talk about dedication, what I mean is *you* must read every publication that’s out there on your topic so your reader doesn’t have to, and more than that, you should read outside of your area of expertise because you never know where the big ideas will come from. Take an afternoon, once a month, and devour your reading material. I read an average of 27 magazines a month. Yes, it can be overwhelming (at times), but the upside is that you are constantly staying dialed into your market. That’s the first step to becoming a filter. Be crystal clear about what you’re filtering. If you’re sitting in a huge market like, let’s say automotive, you probably don’t want to talk about every single car that’s out there or being developed. Perhaps you want to focus only on hybrid vehicles. Now your direction is clear. Once you have this direction, your website should reflect that. Your website should be the first marketing piece you look at as you’re developing your focus. Next, ask yourself if your book is a filter. If it’s not, it should be. Being a filter is tougher for fiction authors of course, but you non-fiction folks should have no trouble leveraging this into your books. Blog, podcast, and write, write, write on trends, reviews, hot new ideas and things that are so-so. I always tell people that I am my own test lab. If you want to try something new in marketing, check with me first. It’s likely that I’ve already tested it on myself. In fact, all of our programs are built from things I tried first. If I don’t like it, or it didn’t work, I won’t sell it. That’s a filter. And I’m not just talking about filtering stuff you can offer to a client, be objective! Be a filter for the competition, too, and by all means, send people to other vendors if they can offer what you can’t. Remember, the customer/reader came to you first. Make customization your best friend. So, let’s use our car example again. Let’s say you wrote a book on hybrid cars and your site is all about hybrids as is your blog, newsletter and podcast. But now you have built your brand sufficiently, and it’s time to break out into new areas. How about this: ebooks for focused markets. Quick and easy tips, like “Buying a hybrid for seniors” or “Buying a hybrid for families.” The key to remember is that each of these markets has its own specific needs. When it comes to buying a car, the needs of a family are different from those of a senior or single. What’s your brand? Everyone’s a brand, even Nora Roberts. Becoming a filter will help you brand yourself. Remember that people don’t buy a book, they buy a brand. If you’re clear on your brand, you’ll sell more books. Figuring out your branding doesn’t need to be complicated, but it does need to be focused. I’m not talking about the kind of branding that requires hours of logo development. I’m not even talking about a brand that’s necessarily original. Yes, you want to be unique, but the key isn’t doing something no one else is doing, the key is doing it better. So how can you become a filter? What’s your market and focus? Perhaps you’re thinking that you can apply some of these principles, but not all of them. That’s OK! The thing to remember is that being an expert is passé. I don’t know if you’ve noticed, but these days everyone’s an expert. They’re a dime a dozen. What you want to be is a filter.